The Bears Pit: v1.13 Weapon & Item Refinement » MAM 2.4.5 - Caliber driven damage, penetration and tumble values - RELEASE! 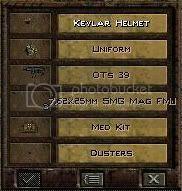 Home » MODDING HQ 1.13 » v1.13 Modding, Customising, Editing » v1.13 Weapon & Item Refinement » MAM 2.4.5 - Caliber driven damage, penetration and tumble values - RELEASE! You'd never know it but a squad of Militia are about to complete training. Here's another minor glitch I noticed. I have also seen some ammo types, 7.62x25 FMJ for instance, when placed on the ground appear to be one tile to the NW. ; Change the color of the Stat Progress Bars shown on your character's information panel. ; The bars can be turned off completely using the in-game Options Menu. The option is on the third column, so click 'Next' to get it. Damn... I looked there... I did! I don't know how that got turned off. I even looked again through the entire JA2Options.ini. I hoped it was something simple. Thanx man... I'm a little embarrassed. It is working now. Good it worked out for you RaterOps! As for MAM 2.5, it is not dead, it's just that I have alot on my plate right now. Im sorry that the new patch/build for ja 1.13 is fracking up your game. But it is a hell of a work to fix it. I have to go through almost every item in the game and change all the stats that this mod affects everytime there is a new build. And I just won't right now, Im sorry. It takes weeks. It would be better though if MAM(the ballistic part of it) was incorporated in the ja 1.13 build. I have now completed all the graphics for the ammoboxes! Now I just have to make them appear ingame... zugh, zugh! I understand. I made several changes that I wanted to keep in Weapons.xml and had to merge them with yours. Whew. Speaking of graphics I also noticed many are too large for the defined display areas and especially in Bobby Rays's shopping screen where they tend to overlap other items. I have no idea if this is a complete list as I haven't finished the game. None are mine! It's a official bug! This is my kind of mod, but what have you done with the money in the game? I see you upped the starting cash to 100000 for all levels, and the IMP cost scaled accordingly to 10000, but have you actually scaled everything in this game with that same ratio? This is making me really hesitant about using this mod, unfortunately, and the fact that it's undocumented doesn't really encourage me to try. I apologize in advance for the lengthy nature of this post. MAM is an excellent mod, and I can't go back to standard 1.13 after having played it. I would go so far as to say that it should be incorporated into 1.13's data files as part of the standard release. However, something that bugs me is a bias toward magnum handgun calibers that is not supported by any empirical data that I am aware of. For instance, in MAM v2.45, the damage from .454 Casull or .50 AE guns fired from guns with 6-8" barrels greatly exceeds that of 7.62 x 51mm fired from 20"+ barrels, and in fact is higher even than .300 Winchester Magnum rifles. I doubt there is a hunter alive who would corroborate the idea that a .50 AE Desert Eagle or a .454 Taurus Raging Bull is more effective against medium-sized game (which humans would be) than a .308 rifle (even if it were loaded to colder 7.62 NATO pressures). I believe this discrepancy stems from the damage formula, which is equal to kinetic energy (KE) at the muzzle modified by energy transfer (defined as damage that is wasted when a round passes all of the way through the body). The problem with using muzzle KE is that heavier, slower handgun rounds lose KE with distance at a much faster rate than rifle rounds, resulting in greatly decreased KE to the target. Also, energy transfer, an advantage of heavier, slower rounds, is fully accounted for, but the advantages of faster rifle rounds (hydrostatic shock, fragmentation, large temporary wound cavities) are only partially taken into consideration. This results in damage numbers that are skewed toward magnum pistol rounds and slow, big-bore cartridges like .50 Beowulf and 12 ga slugs. Logically, if there were no advantage to lighter, faster rounds, we would not have seen a gradual historical decrease in bullet weight and increase in velocity, yet that is exactly what has been happening since the 1800's. Moreover, if longer range were the only advantage of rifle over pistol calibers, ultrashort carbines such as the Micro-Tavor would not have supplanted pistols and SMGs for close-quarters combat and personal defense weapons in militaries, yet this has also occurred. Speaking from personal experience, I have fired Winchester M1894 clones in .44 Magnum and .30-30 and, while the .44 mag kicked a lot harder, the .30-30 (which is significantly less powerful than 7.62 x 51mm) kicked up more dust at 100 yards. Indeed, empirical data shows that .30-30 retains significantly more energy at 100 yards than .44 magnum from a 16" barrel, a gap that widens greatly when you start comparing a 6" revolver barrel for .44 magnum instead. 1) Instead of muzzle KE for damage, use KE at 100 or 200 yards (meters) for rifles and 50 yards for handguns and shotguns. This will give a much more accurate number, and remove the need to account for barrel length in tumble and penetration, as the KE data will already account for this. High energy transfer, bullet expansion, tumbling, fragmentation all equal higher tumble factors and lower penetration. Longer bullets that do not tumble, spitzer bullets, AP ammo mean lower tumble factors and higher penetration. With these 2 fixes, MAM will be as true to life as the JA2 engine allows. *Unfortunately, there is no easy way to derive increased or decreased damage from characteristics like bullet width, mass, and velocity. For instance, a wider bullet means a wider wound channel, but also a shallower one since there is more frontal area exposed to decelerate the bullet. Likewise, a heavier bullet's momentum allows it to penetrate more deeply, but this weight advantage can be totally offset by lower velocity. Higher velocities cause greater damage due to factors like hydrostatic shock, fragmentation, and tumbling, yet potentially less damage due to decreased energy transfer. There is simply no magic formula that can take all of these factors into account and spit out a two-digit "damage" number. If there were, gun enthusiast forums would not continue to be filled with vitriolic arguments over caliber effectiveness that started over 100 years ago. It is much simpler and more realistic to use these factors for increased tumble and decreased penetration or vice versa and leave damage as a simple statement of KE to the target. Even better would be a formula that starts damage equal to muzzle KE and decreases it with range, but this is not possible with JA2 AFAIK. So what your saying in small text is, although the general physics can be accounted for, the actual real life situations vary enough that its hard to calculate it into game terms. As for your points, I agree to the general outlook you give (haven't used this specific mod to comment on its balance) but I do know the physics modeling in the game has some real issues. my particular peeve is the range scale of 10m to 1 tile which I think throws pretty much all the range weapons and explosives off. As for incorporating the mod into the trunk I'd say make a separate topic for that, give the pro's as best you can, make sure to put any specific to OTCH/NTCH stuff in and see what happens. At least bullet physics are generally constant unlike chance to hit issues where the 'human' factor has to fit in. Impossible, in fact. Real-life gunshot wound effects have as much to do with the psychology of the victim as with hard physics. For instance, people who, in the noise and adrenaline of a combat situation, do not realize that they have been shot, are much less likely to stop or fall compared to people who see or feel the wound. Real-life combat situations are so random and have so many variables that even professionals still carry on arguments about the existence or non-existence of basic wounding effects that started 50-100 years ago. If anyone succeeded in making a game or mod that truly represented just how arbitrary and random the real world can be, we would all rage quit in unison (myself included). The best we can do as modders is to realize that even though every aspect of real life cannot be simulated and that it would be foolish to try, we can still find basic relationships that hold true to empirical data, such as that kinetic energy is a good analogue for damage and that rounds that tumble, expand, or fragment to maximize the effect of their energy are bad at penetrating armor and vice versa. 1 square = 10 meters is obviously wrong on preliminary visual inspection (Outhouse in Alma is 2 squares = 66 feet long on each side? ), yet it's hard to come up with a workable solution that does not break suspension of disbelief in some way. Either maximum effective pistol range (~50 meters) is not much farther than arm's reach and sprinting mercs can outrun Formula 1 cars, or spotting distance and effective rifle range stretches across the entire battle map. I recently got back into JA2 after a futile search for a realistic tactical squad-based game that was not hopelessly flawed in some way, at which time I discovered all of the amazing work that this modding community has achieved in the 10+ years that I have been away from JA2. Based on that search, I can confidently state that there is no engine that properly takes effective weapon range and spotting into account. Like terminal ballistics (wounding), it's one of those things that has so many variables that it simply can't be simulated in the way that game designers and modders have tried to simulate it. The only game series that comes close is Brigade E5 / 7.62 mm, and it does not hold a candle to the JA series in overall game experience, polish, or fun factor. I have recently become convinced that the only way to present a remotely realistic experience while keeping the game fun is to adopt a relative scale, where an enemy 5 squares away is within melee range (~20 feet), 10 squares away is within handgun range (~50 feet), 15 is within SMG / shotgun range (50-100 meters), 20-30 is within rifle range (200-1000+ meters), etc. * It wouldn't fit the map visuals, but it would both feel right during gameplay (no excessive scrolling) and be internally consistent. The precise number of squares presented are examples and open to negotiation. On this point I will have to plead ignorance, as I do not know the best way to go about this, and have only a vague idea of the finer points of the OTCH vs NTCH systems. I was one of the people who waited feverishly for JA2 to be released in 1999, talking my non-gamer friend's ear off about it with a level of obsession that only a teenager can possess, and played the series from Deadly Games through UB. It is only recently that I discovered 1.13 and this forum, however, so I am not yet familiar with the different forums and channels to make requests. 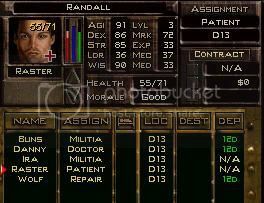 I have made mods for other games, however, and have written a ruleset for an RPG system with similar goals to JA2, so I am not averse to mucking with .xml files. Perhaps you can point me in the right direction? Unfortunately, the human factor is as present in wounding as in chance to hit. *I used a wide definition for "rifle" for a reason, as the delineation between "sniper", hunting, assault, and battle rifles are not nearly as clear as so many games and mods would have you believe. This is as old as the game itself, I believe: For all the reason you mentioned, this "1 tile = 10m" is only used for range value in gun fights. I understand, when it comes to range I think JA has 2 major issues, the first is the map scale to weapon part which I can't say anyone I know is 'happy' with, we all end up just going for a balanced feel rather than semi-realworld. Second is the actual ranges themselves, since its the Effective range of a weapon, which to me is really subjective. There is a huge difference for most firearms between the maximum physics set range, the full range braced longshot, and combat effective range. Well, I can't honestly claim to be an expert, even when I am not actively playing 1.13 I try to keep up with general stuff on the forum, and i've tweaked the weapons for personal use here and there including back in the old days before the source code release. I can't offer much more than my original idea for the topic, and if your not sure on the pro's by CTH system you can always put that in your topic and someone will have an opinion. I'd probably say the Projects forum or feature request would be the best spot for an incorp. topic, though first up I'd contact the Mod creator for Permission. I'd probably clarify it as stopping power may vary by human, though the physical damage is pretty much physics. and Range and damage wise I totally agree games 'simplify' things for modeling and balance. I do think there are differences between the weapon types, but in many cases they are small. any decent medium weight hunting rifle, properly scoped is also a decent sniper weapon. Battle and assault rifles add burst capability and Bayonet lugs. But all of them in good condition with modern machined parts and optics can do a fine job in multiple roles if so employed. True. I would set the max range at the distance at which bullet drop is too significant to be reasonably compensated for in a combat situation. For a 5.56 assault rifle, this ranges from 300-500 meters. Actually being able to hit a target within that effective range is another story. NCTH does a good job of simulating how difficult it is to hit a target in combat, but are longer-ranged weapons also more accurate at short ranges like in vanilla JA2? If so, that needs to be adjusted. Someone can be just as accurate with an MP5 as an M4 at 50 meters, but not at 200 meters. As for scale, I was thinking that it should be divided into short, combat, and long range. Short range is from 7-15 tiles, and represents 10-50 meters at 5 meters/tile. Combat range is 16-40 squares, 60-300 meters at 10 meters/tile. Anything further is long range at 20 meters/tile. This would cause handguns not to blink out of range on every shot, keep most weapons consistent, and preserve a range distinction between calibers like 7.62 NATO (800m, 65 tiles), .300 WinMag (1,000m, 75 tiles), and .338 Lapua (1,500m, 100 tiles). Right now, they all pretty much reach across the entire map. Right. I don't know about you, but the customarily huge bonuses to range, accuracy, and damage doled out to "sniper" rifles in games have always been a pet peeve of mine. I agree the scaling is off, thats probably one of my most vocal peeves about the game, unfortunately its a problem thats too deep to have any easy fixes. The best one I know about is the Big Maps project that makes everything mapwise 3 times bigger making the scale about 1tile for 3 meter. not perfect but definitely a super improvement. To run multiple range categories would require major engine overhaul which would not be worth the time and effort for what you would get from it. and changing scales would cause other issues since it would tweak movement and sight not just firearm range. I was just talking about .xml tweaks, not engine changes (I'm not a programmer). I haven't tried the BigMaps mod, and it does sound like it would solve the range problem, but doesn't it also lead to a lot of extra mouse scrolling? It sounds like a PITA, but if it's manageable, then my short / combat / long range scaling idea is unnecessary and I'll just use BigMaps. Otherwise, the relative scaling would extend the range of handguns, SMGs and shotguns slightly so that it's not always feasible to run up and stab someone with one of those weapons, yet prevent range from becoming effectively unlimited for rifles. Sight range should still be easy to figure, since it would usually fall within the 1/10m combat range. Movement would still require suspension of disbelief, but no more than before. Scrolling depends a lot on your eyesight. You can run the dev versions in full 1080p which gives you something like 100 tiles diagonals. Wow, that would open a lot of possibilities! I'll have to check out the dev version after I finish my current game.